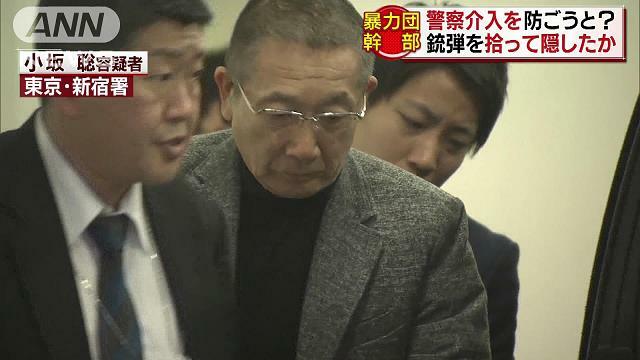 TOKYO (TR) – Tokyo Metropolitan Police have arrested two members of the Sumiyoshi-kai organized crime group for attempting to cover up a shooting at its office in December, a crime likely carried out by a rival syndicate, reports TV Asahi (Feb. 6). On Wednesday, police accused Sumiyoshi-kai members Rinichi Irisato, 69, and Satoshi Kosaka, 64, and five other persons of destruction of evidence. “[My actions] were not related to destruction of evidence,” Kosaka told police in denying the allegations. On December 6, police were tipped off about shots fired at the office, located on the fourth floor of a multi-tenant building in the Kabukicho red-light district of Shinjuku Ward. Officers arriving at the scene found two bullet holes in the front door. There were no injuries in the incident, police said previously. Police believe that the incident was carried out by the Inagawa-kai, a rival gang to the Sumiyoshi-kai. Irisato and Kosaka are then likely to have ordered subordinate members of the Sumiyoshi-kai to collect bullets left at the scene in order to prevent intervention by the police. Kosaka is the chairman of the Kato Rengo, a third-tier gang of the Sumiyoshi-kai. At around 10:00 a.m. on Thursday, police raided the headquarters of the gang in search of evidence in the case.